Complete with an all-star cast including Michael Fassbender (Shame, Prometheus), Penélope Cruz (Vicky Christina Barcelona, Volver), Cameron Diaz (There’s Something About Mary, Bad Teacher), Javier Bardem (No Country for Old Men, Skyfall) and Brad Pitt (Fight Club, Inglorious Bastards), The Counsellor tells the story of savvy and moral lawyer the ‘Counsellor’s’ (Fassbender) attempt at a one-time dalliance in an illegal drug business deal. Hoping to make some quick cash for himself and fiancée Laura (Cruz), the ‘Counsellor’ (Fassbender) becomes embroiled in the treacherous drug underworld through suspicious middle man Westray (Pitt), close friend Reiner (Bardem) and Reiner’s sinister girlfriend Malkina (Diaz). Things quickly spiral out of control and the Counsellor soon realises that sin is a choice and that having it all could mean losing everything. 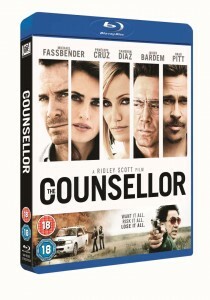 The Counsellor is out now on Digital HD and Blu-ray/DVD on 17 March 2014 from Twentieth Century Fox Home Entertainment.